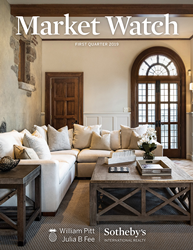 A report detailing market results for the first quarter of 2019 in Fairfield and Litchfield Counties, the Shoreline and the Farmington Valley in Connecticut, the Berkshires in Massachusetts, and Westchester County, New York, has just been released by William Pitt-Julia B. Fee Sotheby’s International Realty, the company announced today. Founded in 1949, William Pitt-Julia B. Fee Sotheby's International Realty manages a $4 billion portfolio with more than 1,000 sales associates in 27 brokerages spanning Connecticut, Massachusetts, and Westchester County, New York. William Pitt-Julia B. Fee Sotheby's International Realty is one of the largest Sotheby's International Realty(R) affiliates globally and the 37th-largest real estate company by sales volume in the United States. For more information, visit the website at williampitt.com [williampitt.com __title__ ]. Sotheby's International Realty's worldwide network includes 990 offices throughout 72 countries and territories on six continents.